We spent more time in line for the moon bounce than it actually took for the kids to get through the giant maze of bouncy goodness. After he appeared at the end, L took off running for the front, not realizing that in order to go through it a second time, he would have to stand in the long line again. When I informed him of such, his spirit deflated and immediately tears began to take shape. My partner and I choose festivals based on whether or not they have moon bounces. Festivals are so hard for us to attend as a family; the large crowds are overwhelming for L to deal with. To make things worse, there are typically musicians that are not only playing loudly on a stage but sometimes, like at NASA’s open house yesterday, the music is then being pumped through speakers all over the area. Festivals more often than not result in tears. They are sensory overload for a child on the Autism Spectrum. 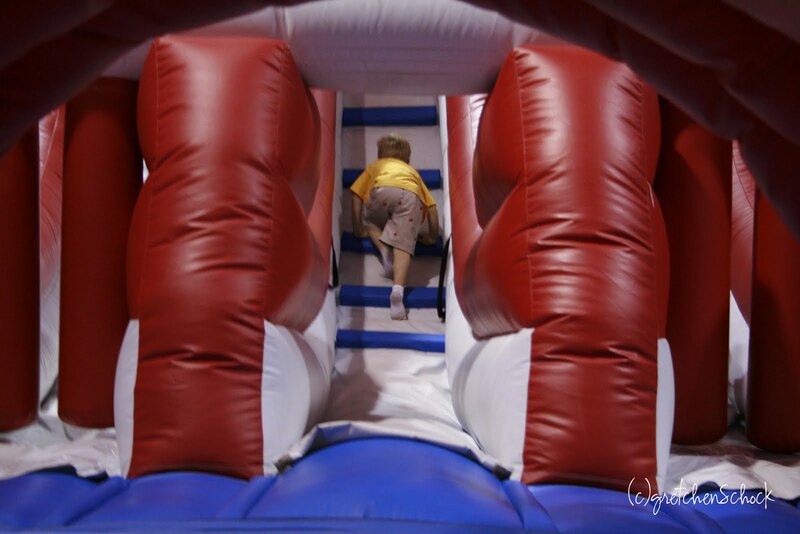 But if there is a moon bounce, it is our personal saving grace. As long as L can go through the moon bounce, all is well in the world and we can enjoy other activities at the festival. If we know in advance that there will be a moon bounce, we talk up the excitement of it. I’ve often wondered what it would be like if we had one in our backyard. Would the neighbors complain about the constant hum coming from the generator? Maybe we could become an attraction on the block and charge a fee to the entire neighborhood. The money we make from the neighbor kids might put my kids through college! Or if nothing else, instead of being labeled by his peers as “weird,” maybe he might be that cool kid who has the moon bounce in his backyard. For me it’s a moment in time that doesn’t happen often. He is engaged in an activity with other children instead of playing by himself on the perimeter, being an observer of life. It’s a moment where L would appear as any other “normal” kid to a passerby. And some days, I’m willing to buy a moon bounce if that simple moment can last a little longer. Is there something you wish you could buy in order to help your child overcome an obstacle? Oh wouldn't that be dreamy? OT and ST every day! My paycheck doesn't support that sadly.